Sara Hazelnis of Liberty, NY is a current Brandeis senior who studies Public Health & Psychology. 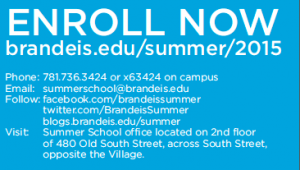 She discovered Brandeis Summer School in 2011 and has been drawn back each summer by the small class sizes and the way in which summer courses are delivered. She also notes that there are more opportunities in the summer for hands-on learning than in the fall and spring semesters, particularly with the Justice Brandeis Semester offerings. During the regular academic year at Brandeis Sara works in the Hiatt Career Center as a Hiatt advisor, office attendant, and alumni relations intern. You can also find her working as a junior manager at the Brandeis Bookstore. See a full listing of our summer courses by department to explore the great opportunities there are for you. Previous PostReserve Your Spot in the Suzuki Theater Arts Course with Jesse Hinson this SummerNext PostNeed to Meet your Non-Western and Comparative Studies Requirement?